Got an e-mail from Greg Byrnes (aka "carpet") in NZ, who complimented Real Skate and wanted to link to us. 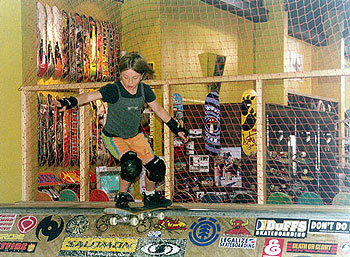 He had heard about Gurlz on Boardz through an American female skater, Allie Allen, who came to his town on internship and subsequently held some all girl workshops. I checked out his site, to see what Allie had been up to, and there I saw a very tiny 8 year old girl skateboarder. Turned out to be his daughter, Shannon. I told Greg I MUST feature her on Gurlz on Boardz, and to ask her if she was interested; she was. But, since it wasn't feasible to fly to NZ to do an interview, I asked if he would hook me up with some some pics of her and a profile. So, who was the best man for the job? Grandpa! Yup. There is no denying that most grandparents, if given even half a chance, will wax lyrical about their grandchildren and I have to admit that I fall into this category with an almighty thud. For when it comes to extolling the virtues of my grandchildren I tend to be as one-eyed as the mythical Cyclops. So when my son-in-law, Greg, asked me if I would consider writing a piece on the skateboarding achievements of my elder granddaughter, Shannon, I grasped the opportunity to trumpet the sporting prowess of an effervescent, self-confident, in your face, "leave me alone, I can do it" nine year old. What I admire most about Shannon, apart from all her other endearing qualitieswhich, I might add, her parents will argue they have yet to seeis her determination to excel. Highly competitive, she just cannot accept being second best. Consequently, for her, fear is the prospect of being asked to eat broccoli for dinner or to tidy her room. It has little or nothing to do with "dropping in" on a skatebowl which can, at the best of times, test the nerve of even the most accomplished skater. And, since skateboarding is not for the faint-hearted, her attitude not only puts into perspective the sporting mindset of this nine year old daredevil but, more important, speaks volumes of her grit and determination to be the best. 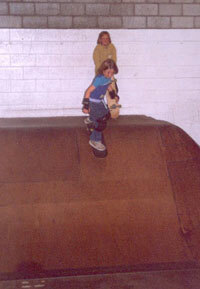 Shannon developed an interest in skateboarding initially because her father, Greg, was given the task of developing a skate park. A work colleague who happened to be an excellent skater was being sponsored by a local business and because of this, and the fact that his workmate's enthusiasm for the sport was so infectious, Greg felt the urge to give it a try, particularly since he had been a keen skater as a teenager. It was only a matter of time, therefore, before Shannon became hooked as well. Greg got her a board and they both started going to the local parks where they quickly mastered the basics of the sport. From there they moved to mini-ramps where it took a lot more time and, certainly, a lot more courage to try out some of the more difficult maneuvers. Being older, Greg was, understandably, less confident but Shannon took it all in her stride. I should add, at this juncture, that my home in Christchurch (New Zealand) looks out over a popular skatebowl. It is one of the more difficult bowls to master because of its intimidating steepness. I should also add that, not being for the faint-hearted, the Waltham bowl, as it is called, tends not to attract female skaters. In fact, until recently, skateboarding attracted few females at all because of the high risk factor and the predominance of intimidating males. But this nine year old girl who sees a challenge in almost every facet of her life would not be deterred. Try to visualize the scene if you cana small blonde girl with floppy T-shirt, baggy cargo pants, and protective gear waiting her turn to enter the bowl behind older more accomplished male skaters. I am certain that on that particular day when she first attempted to "drop in" to Waltham, fate was to lend a helping hand in what was to be a turning point for Shannon as a skateboarder. For, practicing at the ramp that day was a young California woman named Allison Allen or Allie as she liked to be called. Allie, being an extremely capable surfer, snowboarder, and skateboarder, took young Shannon under her wing and gave her a few coaching tips. From that day onwards they would meet regularly at the bowl when Allie wasn't surfing. It was at this point that my son-in-law, Greg, began to become acutely aware of the obvious potential of his daughter as a skater. Increasingly captivated by her enthusiasm Greg was quick to recognize the need for a platform that would allow young women to demonstrate their skateboarding skills in a totally female environment. So he and Allie put their heads together and came up with a plan. Together they would organize a skateboarding workshop for young females between the ages of 8 and 25 to take place over the Christmas/New Year holiday period. They also came up with a catchy name for the workshop "Rolling With The Sisters." Without going into too much detail about "Rolling With The Sisters" as a community project, Greg worked extremely hard to obtain worthwhile sponsorship while Allie coordinated the exercise as well as tutoring. 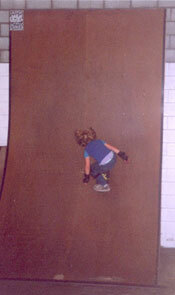 Other well-known local skateboarders also acted as instructors. Needless to say the whole venture was a roaring success, attracting considerable media attention. It featured on the network TV news, regional TV news, as well as a popular network TV children's programme called Squirt and Shannon, being the youngest participant, was usually sought out for interviews. Her blonde hair, endearing smile and freckled nose complimented the burgeoning skateboarding skills of this supremely self-assured nine year old. So, did she become an overnight celebrity? Not really, but celebrated enough to have her picture on the front page of The Press, Christchurch's daily rag. As the summer progressed Shannon went from strength to strength. She was prepared to skate anywherebowl, ramp, and street. She has gone from just rolling around to doing "ollies" and 50/50 grinds and admits that transition is her forte. Even now she practices ollies on the carpeted floor at home much to the annoyance of her mother, Siobhan. I should point out, though, that she has had her fair share of tumbles, scrapes, and bruises. For an nine year old it is not easy "slamming" and then having to get up and try again especially when there are males present. Yet I have overheard, time and time again, really good skaters remark "Hey, have a look at that kid. She's really good." Peer group pressure can be very influential. So for someone who is so young to be acknowledged and acclaimed in this way by an older age group is, arguably, the highest form of accolade. I should, however, add that, were it not for the dedication of her father, Greg, the support of her mother, Siobhan as well as that of her younger siblings, Danny and Amelia, and not forgetting the contribution of Allison Allen, Shannon's success in skateboarding may not have been as rapid as it was because raw talent is not quite enough. It needs to be carefully nurtured.